This is the only photo I have of Gladys. 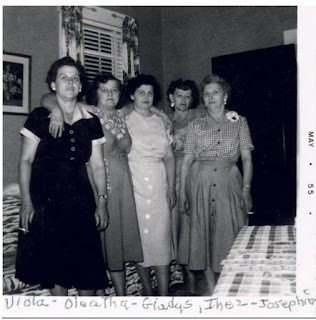 She is standing (her left) next to my Grandmother Inez and her sisters. She was born on 4 Oct 1910 in Cloverport, Breckenridge, Kentucky ~ passed away on 21 Dec 1980 in Hart Co., Kentucky ~ Internment at Upton Cemetery, Hart County, Kentucky.